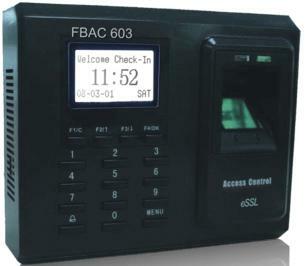 FBAC 603 (702) is a standalone fingerprint T & A + Access Control system, IN and OUT status, also low price with good performance, designed especially in the purpose of popularizing the fingerprint products. It could store 1,500 fingerprint templates and 50,000 transaction records. Capacity Stores up to 1,500 templates and 50,000 Transactions. No need to enter PINS. Supports 50 time zones, 5 groups and 10 unlock combinations. Tamper-proofs switch and alarm outputs. Operates stand-alone without a computer. TCP/IP, serial and Wiegand interfaces. Audio-Visual indications for acceptance & rejection of valid and invalid fingerprints.